Inspired by an article of Clemens I decided to make my own very fast and easy ADF BC Coherence example project ( I use in this project the HR schema tables ). This Jdeveloper 11g project is a bit different then that of Clemens. 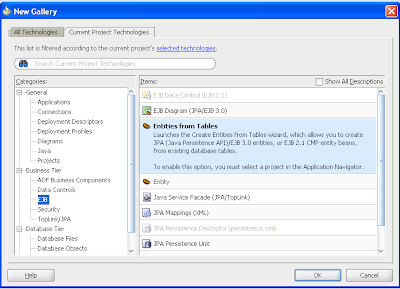 I will use not a local cache and I will use a JPA provider to fill the Coherence cache. Clemens uses an entity to fill the cache. In my case the JPA Toplink ( eclipselink) provider fills the cache. The ADF BC viewobjects reads this cache and the transactions are handled by the ADF BC entities ( my own EntitiyImpl updates or add the cache entries). It is now very easy to use coherence with ADF BC, you don't need to program java or know much about coherence. There are only five steps to make it work. 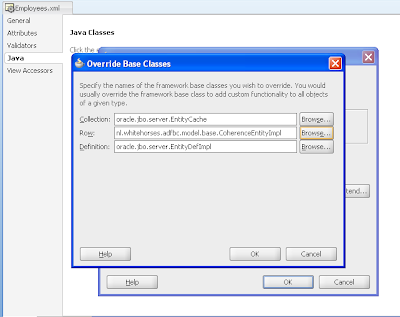 Step 3, Create an ADF BC entity ( same attributes and java types as the EJB entity ) and override the row entity class. 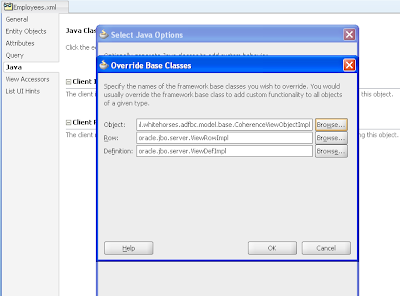 Step 4, Create on the just created entity a new default view and override the viewobject object. We start by adding a new EJB entity. We need to change the persistence xml and add some extra jdbc properties. Coherence won't use the datasource so we need to add eclipselink.jdbc properties. Change my values with your own database values. here is my configuration xml, Where I add for every ejb entity a new cache-mapping. If I add the ejb entities under the same package name and use the same persistence unit I can use the same distributed-scheme. Add these parameters to run options of the model and viewcontroller project. Now JDeveloper knows where to find the coherence the cache. 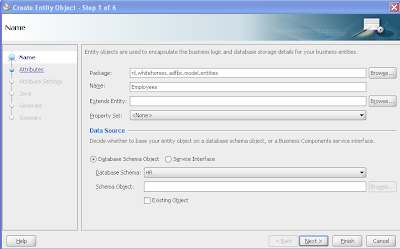 Create an new entity with the same name as the ejb entity and don't select a schema object. We will add our own attributes to this ADF BC entity. Add at least all the mandatory attributes to this entity. These attributes needs to have the same name and java type as the ejb entity. I created a new EntityImpl ( Inspired by the great work of Steve and Clemens). This EntityImpl has it's own doDML. In this method I use reflection to dynamically update or add entries to the Coherence Cache. download coherence at otn and put the jars in the coherence\lib folder. 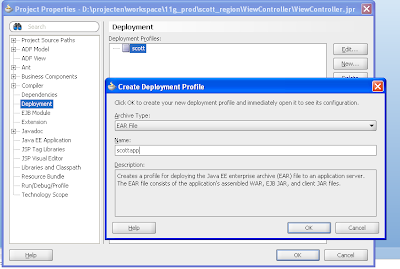 Rename the internal coherence folder of jdeveloper else you can't connect to the cache. 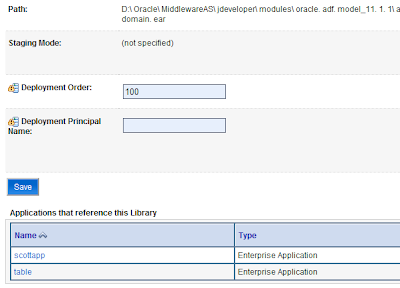 Update the project options with your own coherence settings, also the weblogic run options of the application. And Start Coherence and fill the coherence cache before running. 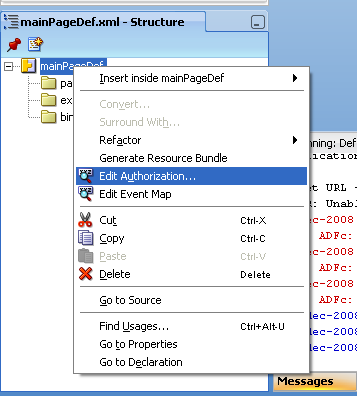 In JDeveloper 11g is possible reuse pages in different applications. For example you can make one registration process which you can use in your all applications. If you breakup your application in reusable parts you can use these parts in all your applications, this will reduce maintenance and lower the complexity of your application because you now have small applications which has only one purpose. 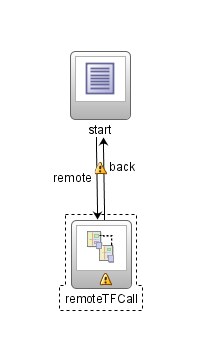 These parts must be bounded Task Flows and must contain at least one view and a Task Flow return component. We can deploy this TF to an application server and call this TF from your application. You will be automatically redirected to this TF and when we are finished we will return to your application. To do it yourself follow these steps. 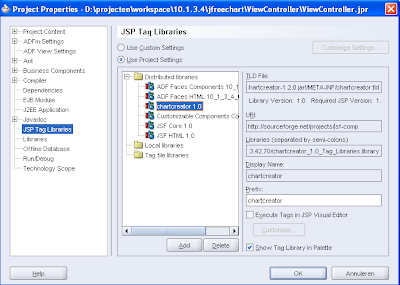 First create a new Application or ADF viewcontroller project. 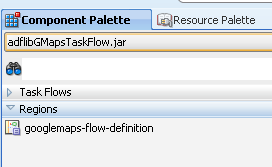 In the ViewController project we will create a bound task flow ( de-select the page fragments option). In this TF we add a view and a TF return component. Between these components we will add control flow case called return. 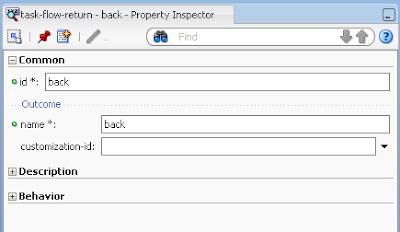 Select the task flow return component and provide a value to the name of Outcome. We need this value for the return control flow case of our calling application. To make it more interesting let's add an input and a return parameter. Deploy this TF to an application server. See this blog entry how to this. If you get a deployment error then it can help to remove the listener in the weblogic-application.xml. See the Oracle forums for more details. 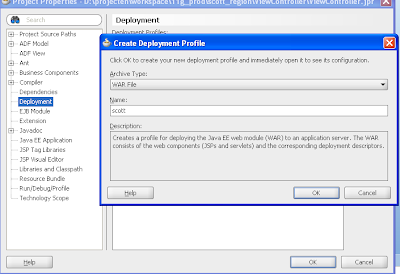 The next step is to add an ADF library deployment profile to your TF and deploy your TF code to a jar. Now go to your calling application and add this jar as a library to theviewcontroller project. Because the remote TF is running on a other application server we need to provide the url. In my case http://localhost:7001/remote/faces/adf.task-flow? . This url must end with faces/adf.task-flow?. 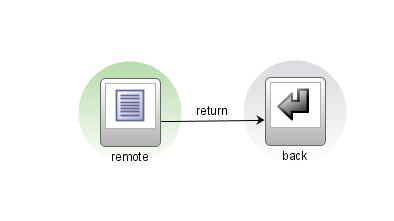 This remote TF has an input and a return parameter so let's add a value to these parameters. 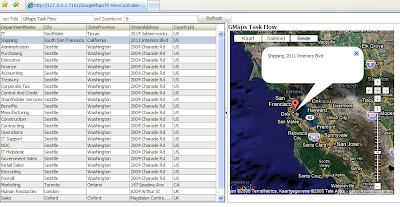 I made a stand alone google maps Task Flow which you can use as region in your jsf pages. 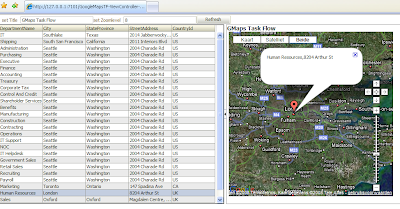 This Task Flow is based on GMaps4JSF and you only have to fill the input parameters and the Task Flow will display you the location and popup the description of this location. Here you see some examples where I use the department table of the HR schema as input. 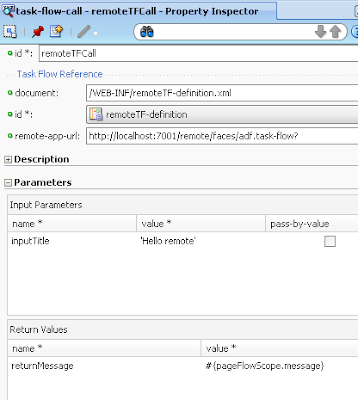 This Task Flow has the following four input parameters. 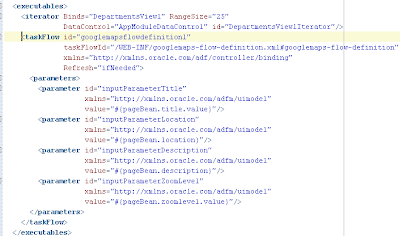 Here the steps to integrate this Google maps Task Flow in your own Application. 1) Add the Task Flow jar to your own viewcontroller project. 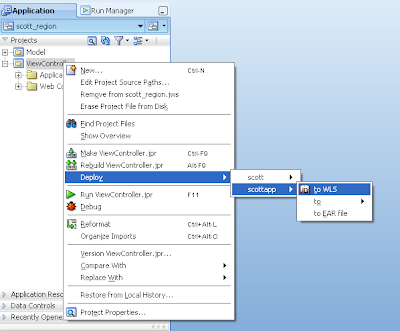 The jar is located in the deploy folder GmapsTaskFlow project. 2) Drag the task flow from the component palette to your page. 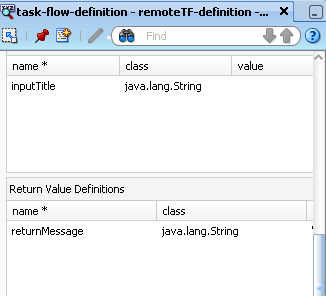 This will add the region component to the jsf page and a task flow binding in the Page definition. Open the PageDef of your page and add some values to the inputparameters. that's all. Here is the google maps workspace with the Task Flow and a test project where I use this TF. ( It works on the HR schema ). Here some code how to fill the location parameter in an ADF rich table by using your own selection listener. With JDeveloper 11g you have many out of the box JSF graph components but too bad this isn't the case in JDeveloper 10.1.3. In this blog I will show you how you can have free graphs components and use it in 10.1.3. Here are some examples with ADF. Add chartcreator as taglib to your project. 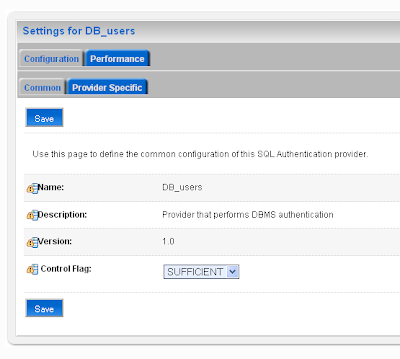 In WebLogic you can use database tables as authentication provider for your web applications. 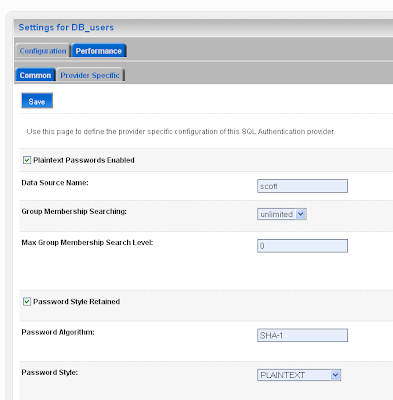 In these tables you can store your application users with its roles. 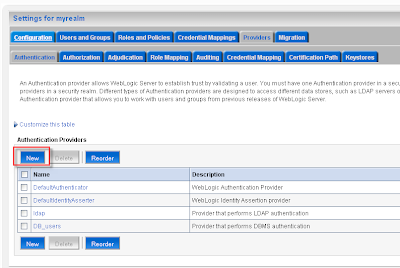 WebLogic will use these tables for your application authentication. 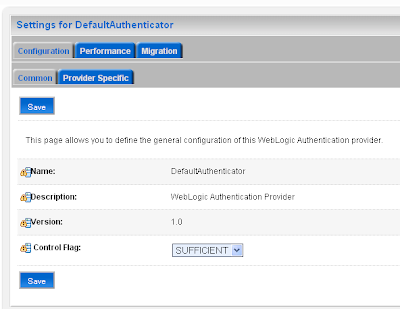 WebLogic even provides you a web interface where you can add or change users / roles. You can use this SQL authenticator for your container security or use it for your JDeveloper 11G ADF security. 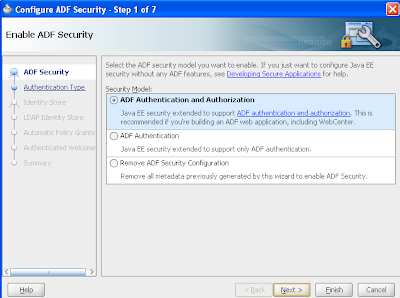 For more info over ADF security see my previous blog. This SQL authenticator replaces the dbloginmodule of the OC4J container which was available in the Technical Previews of JDeveloper 11g. First we need to have some authorization tables. I will use the user and roles tables of JHeadstart. Here is the ddl with some sample users. 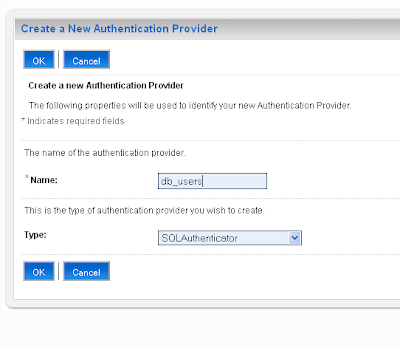 Now we can add the SQL authenticator provider in WebLogic. 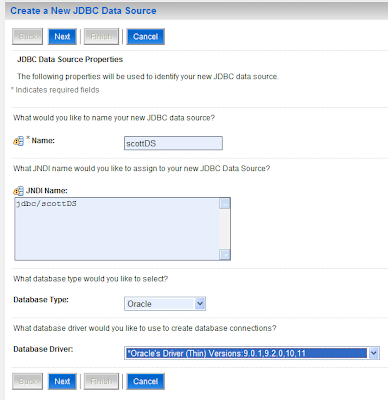 First we need to create a datasource for the database connection and remember the datasource name ( not the jndi name) We needs this value for the provider. 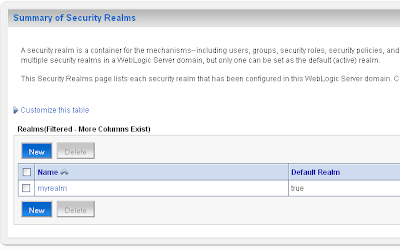 Select the Security Realms link then I will select the default realm "myrealm" and go to providers tab. Here we can create a new authentication provider. 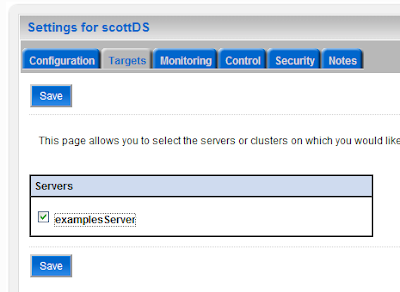 Select your just created provider and change the Control flag to sufficient. After this we can go to the provider specific tab where we can add the details of the provider. 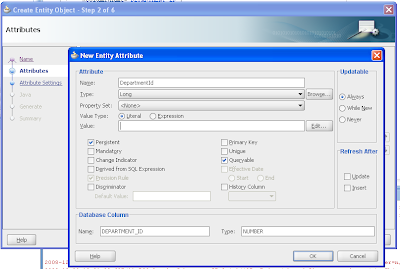 We need to fill in the datasource name, select a password algorithm and add many SQL statements. Here are my settings for the jheadstart tables. When we select SKING we can add roles to this user. 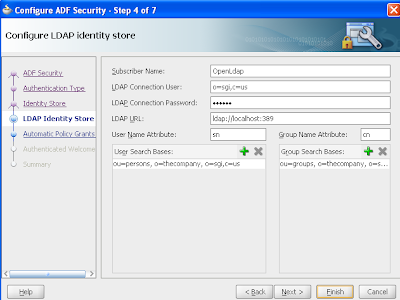 With ADF Security of Jdeveloper 11g you can use ldap or a table as authentication provider in WebLogic. To make for example a new ldap provider see my blog or the one of Frank Nimphius. 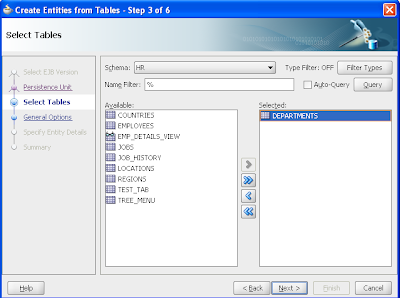 Next blog I will show you how can use user and group tables as a provider in WLS. First before we the ADF Security wizard we first need to configure WebLogic. I will using the internal WLS server of JDeveloper 11G. Start the instance and go to http://localhost:7101/console/ Go to the security realms. 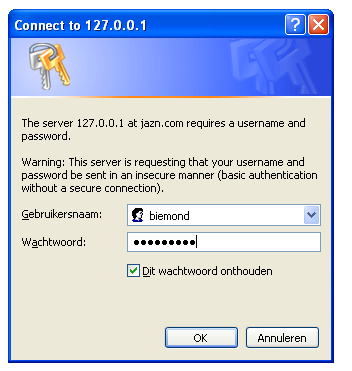 Default is your realm 'myrealm' and not jazn.com. Change the default authenticator from required to sufficient else the provider will never be used. And we are finished with the wizard. Now we have tto change the jazn-data.xml where we will add the realm and add the roles. 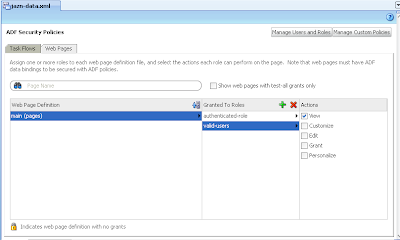 These roles will be used in the page authorization. 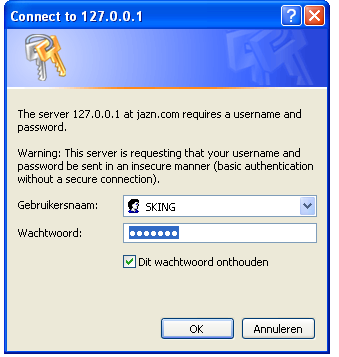 Now open the pagedef of the JSF page and add a security policy to this page or you can open the jazn-data.xml and select the page. 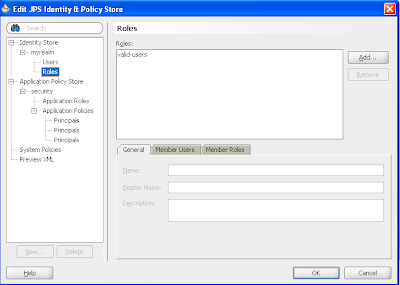 Select the page and select a role where we add actions to this role. 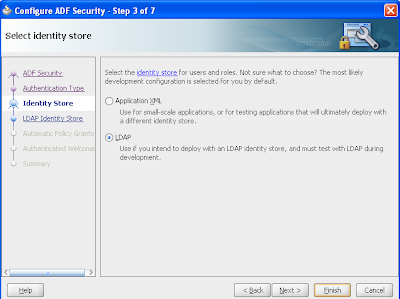 Probably this will change in other 11G versions where the ADF Security wizard will configure WLS. 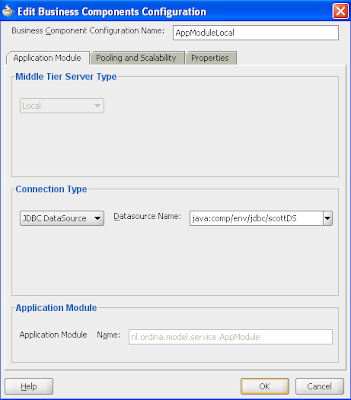 Deploying your web application from JDeveloper 11g to a WebLogic 10.3 Server is not so simple as with the internal WebLogic server of JDeveloper. Off course we need to install the WebLogic 10.3 and install the ADF runtime 11g to this server ( See my previous blog for this ). Very important, you must enable this datasource by selecting a target. 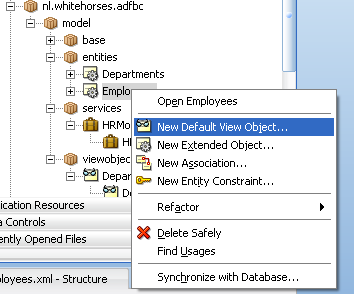 Default the target is not selected and the datasource is disabled. 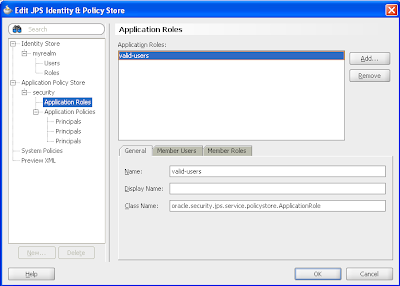 Add a war deployment to your application. Give the application a root context. Now we need to add a ear deployment to your application.